Information provided by Carolyn P. Drennen 3841 Valley Head Rd. 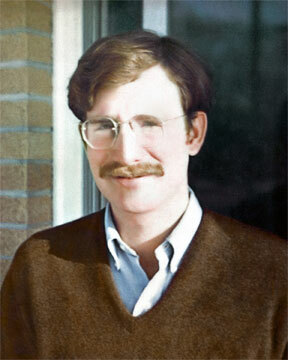 Birmingham, AL 35223 on 15 March 1982; copied from Bates Family Bible. 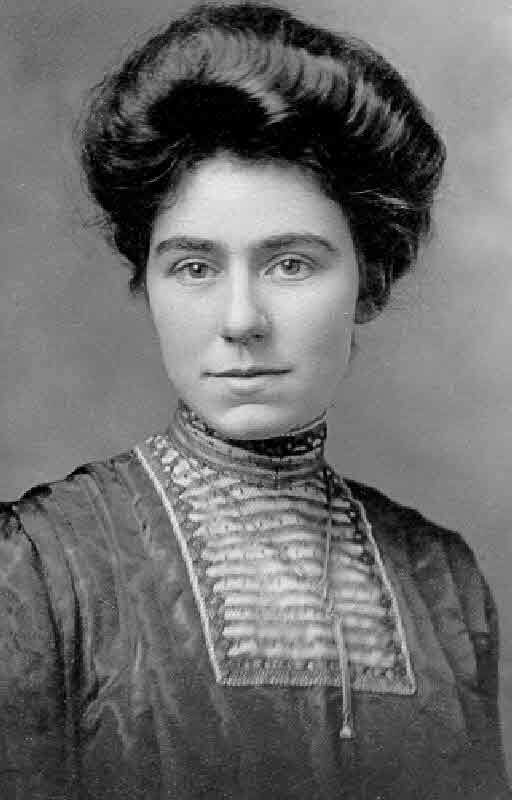 James Mason married Fannie Alice Skinner, daughter of Judge George Gaines Skinner and Mary Eugenia Hill. Fannie Pryor Mason was the daughter of James Mason and Fannie Alice Skinner. Fannie Pryor Mason married Lawrence Hazelmyer. Lawrence Hazelmyer married Fannie Pryor Mason, daughter of James Mason and Fannie Alice Skinner. Possibly related to Col. W. A. Buck of the 24th Alabama Reg. of the Civil War? John E. Buck was born circa 1862 at AL. He married Anna Harvey Skinner, daughter of Judge George Gaines Skinner and Mary Eugenia Hill, circa 1901. Never married; lives in nursing home in Montgomery. [S182] Social Security Death Index (on-line), Ancestry.com, SSDI, Ancestry.com, SSAN 423-03-0263. [S182] Social Security Death Index (on-line), Ancestry.com, SSDI, Ancestry.com, SSAN 423-60-2874. [S182] Social Security Death Index (on-line), Ancestry.com, SSDI, Ancestry.com, SSAN 419-03-8364. 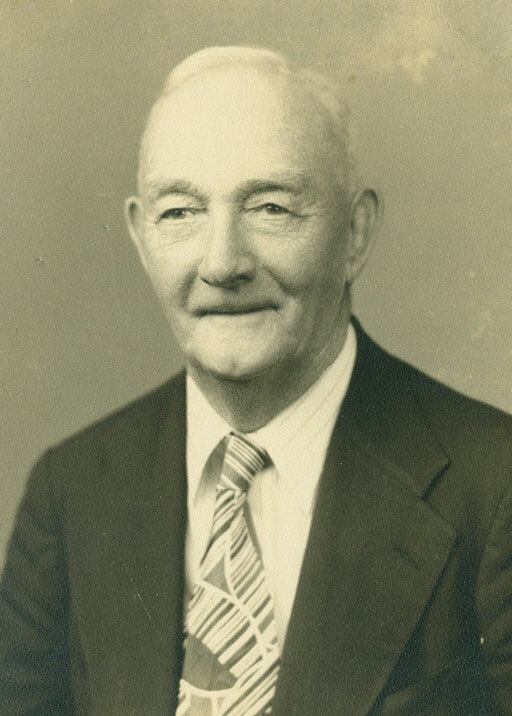 Earnest Hill Buck was born on 13 February 1911. He was the son of John E. Buck and Anna Harvey Skinner. Earnest Hill Buck died in March 1980 at age 69. Robert Hales Marshall was born on 21 June 1875 at Sunflower, Washington Co., AL. He was the son of Edward Lindsey Marshall and Jennie Sophia Williams.1 Robert Hales Marshall married Laura Bruce Skinner, daughter of Judge George Gaines Skinner and Mary Eugenia Hill. Robert Hales Marshall died on 5 October 1952 at Jefferson, Jefferson Co., LA, at age 77. Dr. Robert Bruce Marshall was born on 4 October 1901 at Sunflower, Washington Co., AL. He was the son of Robert Hales Marshall and Laura Bruce Skinner. Dr. Robert Bruce Marshall married Rose Emily Steckler in June 1926 at New Orleans, LA. Dr. Robert Bruce Marshall died on 9 December 1958 at Sulpher, Calcasieu Co., LA, at age 57. Olive Jane Marshall was born on 22 August 1908 at AL. She was the daughter of Robert Hales Marshall and Laura Bruce Skinner. Olive Jane Marshall died on 29 December 1990 at Shreveport, Caddo Co., LA, at age 82. Ruth Dudley Ludington was born on 15 June 1893 at MS. She was the daughter of Louisa (?) Ruth Dudley Ludington married Eugene Randal Skinner, son of Judge George Gaines Skinner and Mary Eugenia Hill. Ruth Dudley Ludington died in November 1972 at age 79. Fred was enumerated in the 1940 Mobile, Mobile Co., AL, federal census, ED49-98A, in the household of his father, Fred. He was 28 and employed as an office worker in a fruit produce company owned by his father. His mother was deceased and there were no other family in the household. [S807] Find A Grave, online http://www.findagrave.com, memorial 111735357. Thomas John Hill was born on 10 October 1839 at AL. He was the son of John William Henry Hill and Mary Bates. Laura Alice Hill was born on 3 April 1844 at Mississippi. She was the daughter of John William Henry Hill and Mary Bates. Laura Alice Hill died on 10 October 1910 at Crescent, Iberville Parish, Louisiana, at age 66. Margaret Hill was born on 10 February 1846 at AL. She was the daughter of John William Henry Hill and Mary Bates. Eliza Florence Hill was born on 6 January 1848 at AL. She was the daughter of John William Henry Hill and Mary Bates. Eliza Florence Hill died on 15 August 1861 at age 13. John Edward Hill was born on 5 December 1858. He was the son of John William Henry Hill and Mary Bates. John Edward Hill married Theresa Josephine Hotard on 10 February 1892 at Regina, Louisiana. John Edward Hill died on 5 November 1910 at Plaquemine, Louisiana, at age 51. Theresa Josephine Hotard was born on 19 July 1873 at Grosse Tete, Louisiana. She married John Edward Hill, son of John William Henry Hill and Mary Bates, on 10 February 1892 at Regina, Louisiana. Theresa Josephine Hotard died on 17 January 1961 at Belle Chasse, Louisiana, at age 87. Thomas Convers was born on 28 October 1699 at Woburn, Middlesex Co., MA. He was the son of Samuel Convers and Dorcas (?) Thomas Convers married Martha Clough on 11 April 1723. Thomas Convers married Abigail Fay, daughter of Samuel Fay and Tabitha Ward, on 3 November 1737 at Sturbridge, Worcester Co., MA.2 Thomas Convers died in 1760 at Thompson, CT.
[S24] Charles Allen Converse, Some of the Ancestors and Descendants of Samuel Converse, Jr., of Thompson Parish, Kiliingly, Conn., Page 35/Item 15. Daisy Helen Glassburner was born on 13 February 1887 at Charter Oak, Crawford Co., Iowa. She was the daughter of John B. Glassburner and Amanda Ellen Boyer. Daisy Helen Glassburner married Joseph Elmer Hallowell, son of Peter Joseph Hallowell and Matilda Garland Scott, on 24 November 1910 at Charter Oak, Crawford, Iowa. Daisy Helen Glassburner died on 12 July 1963 at Denison, Crawford Co., IA, at age 76. She was buried at Dow City Cemetery, Dow City, Crawford Co., IA. Daisy's childhood years were spent on the family farm. She attended public schools and graduated from Charter oak igh School in 1903. Later, Daisy attended Denison Normal and was a successful teacher in the Crawford Cpounty schools for six years. She was married on thanksgiving Day, November 24, 1910. The Hallowell's spend most of their married life on a farm north of dow City. In 1945 they moved to Jefferson. Daisy was a life-long, active member of the Methodist church and the Woman's Society of Christian Service. James Garfield Rule married Ada Eunice Hallowell, daughter of Peter Joseph Hallowell and Matilda Garland Scott, circa 1910. Julie was enumeraed in the 1920 New Trier, Cook Co., IL, federal census in the household of her parents John and Emily. [S182] Social Security Death Index (on-line), Ancestry.com, SSDI, Ancestry.com, SSAN 333-05-4979. [S111] Unknown name of person, unknown record type (June 4, 1946). [S748] Robert J. Houser, DC: Robert Houser. 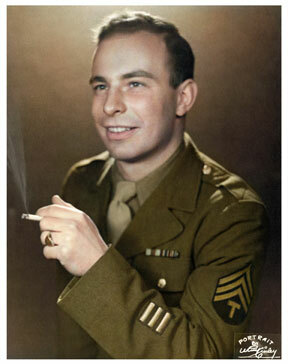 [S807] Find A Grave, online http://www.findagrave.com, Find A Grave, database and images (https://www.findagrave.com : accessed 11 April 2019), memorial page for Robert J. Houser (19 Aug 1922–30 Apr 2012), Find A Grave Memorial no. 132438760, citing Oakland Cemetery, Sandusky, Erie County, Ohio, USA ; Maintained by Bud Hummel (contributor 47222781) . 1938 graduate of Sandusky High School and went on to become a dental hygienist. She was active in the Alumni Chorus of the SHS Choir. 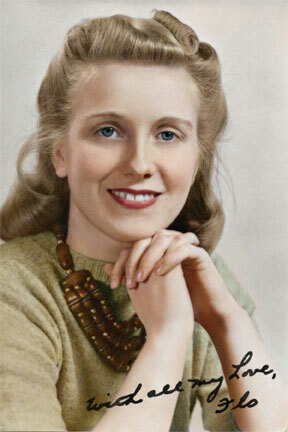 She married Robert Houser, also of Sandusky, on August 19, 1945. Mrs. Houser followed her husband during his military career living in Erie Army Depot, Port Clinton, OH, Richmond, VA, Washington, DC, Honolulu, HI, Cleveland, OH, Carlisle, PA, and Fort Knox, KY. She was active as a volunteer in her children's schools as well as church and military wives' groups. After his retirement from the military in 1963, the couple returned to Sandusky where Mrs. Houser remained active in the Episcopal Women of the Church at Grace Episcopal. In 1971, they relocated to Sanibel Island, FL, later to San Carlos, FL and finally to Rotonda West, FL, where she enjoyed golf and watching Mr. Houser play Senior Softball. In 1997, they moved to Holly Springs, NC, to be near family. She was preceded in death by her son, David Houser, and her brother, Armin Bechtel. She is survived by her husband of fifty-three years, Robert, of Holly Springs, NC; her daughter and son-in-law Dianne and Joe Holcombe of Cary, NC; two granddaughters, Amy Holcombe of Greensboro, NC, and Melissa Holcombe of Boone, NC; three grandsons, Robert Holcombe of Enterprise, AL, David Holcombe of Greensboro, NC, and Richard Holcombe of Cary, NC; two sisters, Anna Ruth Beamer of Largo, FL, and Winifred Beckett of Warren, MI. A grave side service will be held at Oakland Cemetery in Sandusky at 11 am on Saturday, April 24. The service will be conducted by the Rev. Ernest Matijasic of Grace Episcopal Church where the couple attended for a number of years. Friends can contact the family through Mr. Houser's two brothers- Paul Houser at 433-4916 or Bill Houser at 433-3017. Florence was living in Holly Springs, Wake Co., near her daughter, Dianne when she died in the hospital where Dianne worked. [S182] Social Security Death Index (on-line), Ancestry.com, SSDI, Ancestry.com, SSAN 297-03-9449. [S807] Find A Grave, online http://www.findagrave.com, Find A Grave, database and images (https://www.findagrave.com : accessed 11 April 2019), memorial page for Florence Della Bechtel Houser (23 Jun 1920–19 Apr 1999), Find A Grave Memorial no. 98557200, citing Oakland Cemetery, Sandusky, Erie County, Ohio, USA ; Maintained by LindaB (contributor 47135363) . David was born on March 1, 1949, in Sandusky, Ohio, to Robert James Houser and Florence Bechtel Houser. He grew up with his sister, Dianne. He played the trombone in High School and was active in sports. He was not married, but left behind his girlfriend, Renee. He joined the Army and was assigned to the unit he wanted in the Army's Navy, Watercraft Engineer. His tour of duty began on January 9, 1971, and just six weeks shy of returning home, he disappeared from his boat one night in the Mekong near Vihn Long Province and his body was recovered ten days later. He was assigned to 1099TH TRANS CO, 159TH TRANS BN, 4TH TRANS CMP ARMYS PT CMD, SAIGON, 1 LOG CMD. He was awarded the National Defense, Vietnam Service, Vietnam Campaign Medals and Vietnam Gallantry Cross Unit Citation. MOS: 61C20 = Watercraft Engineer. Rank: SP5 = Specialist Five. Pay grade at loss E5. Unit of Assignment: 1099TH TRANS CO, 159TH TRANS BN, 4TH TRANS CMD, ARMY SPT CMD SAIGON, 1ST LOG CMD, USARV. 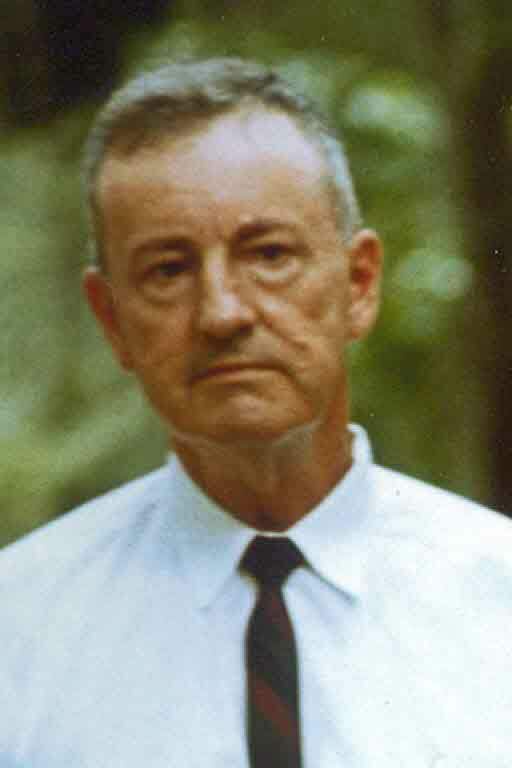 [S807] Find A Grave, online http://www.findagrave.com, Find A Grave, database and images (https://www.findagrave.com : accessed 11 April 2019), memorial page for SPC David Robert Houser (1 Mar 1949–17 Oct 1971), Find A Grave Memorial no. 128373490, citing Oakland Cemetery, Sandusky, Erie County, Ohio, USA ; Maintained by Charles Reed (contributor 47261371) . Died by October court 1784 (probate.) John Harvey married Sarah Blount, daughter of Charlesworth Blount and Mary Clayton, on 16 February at Perquimans Cnty. John Harvey was born on 3 October 1747. He was the son of John Harvey and Mary Bonner. John Harvey died in 1784 at Perquimans Cnty. Sarah Blount married John Harvey, son of John Harvey and Mary Bonner, on 16 February at Perquimans Cnty. Sarah Blount was born on 29 February 1752. She was the daughter of Charlesworth Blount and Mary Clayton. Sarah Blount died on 20 September 1776 at Perquimans Cnty. at age 24. Anna Harvey was born on 6 June 1775. She was the daughter of John Harvey and Sarah Blount. Anna Harvey married John Skinner, son of Joshua Skinner and Sarah Wingate Creecy, on 24 June 1790 at Perquimans Cnty. Anna Harvey married Thomas Billings on 3 February 1820. Anna Harvey died circa 1835. John Skinner was born on 7 October 1760 at Perquimans Co., NC. He was the son of Joshua Skinner and Sarah Wingate Creecy. John Skinner married Mary Creecy, daughter of Levi Creecy, on 15 June 1780. John Skinner married Sarah Harvey, daughter of Thomas Harvey and Mary Blount, in 1786. John Skinner married Anna Harvey, daughter of John Harvey and Sarah Blount, on 24 June 1790 at Perquimans Cnty. John Skinner died on 31 December 1819 at Montpelier, Chowan Co., NC, at age 59. The 1790 census, Edenton District, Perquimans Co., NC. lists John Skinner Esq., 1 male over 16, 1 male under 16, 2 females, 38 slaves. Will of Ann (Harvey) (Skinner) Billings, Edenton, NC, April 23, 1834; May term 1837. Dtr Harriet Singleton, granddtr Anna Harvey singleton, son Jos H. Skinner tablespoons marked JS, son Henry A. Skinner; the last two named executors. Test. F. Norcom, Jos. N. Hoskins (Virginia Magazine). [S69] Doris Seymour Wahl and Cynthia Walker Rummel, The Skinner Kinsmen, The Descendants of Richard Skinner of North Carolina, Page 30. Harriet Harvey Skinner was born in 1794 at NC. She was the daughter of John Skinner and Anna Harvey. Joseph Harvey Skinner was born in 1796. He was the son of John Skinner and Anna Harvey. John Adams Skinner Dr. was the son of John Skinner and Anna Harvey. Henry Augustus Skinner was born in 1810 at Montpelier Farm, Chowan Co., NC. He was the son of John Skinner and Anna Harvey. Henry Augustus Skinner married Mary Creecy, daughter of Nathan Creecy and Elizabeth Rice, on 24 November 1829 at Chowan Co., NC. Henry Augustus Skinner died on 4 October 1853. He was buried at Catholic Cemetery, Mobile, Mobile Co., AL. 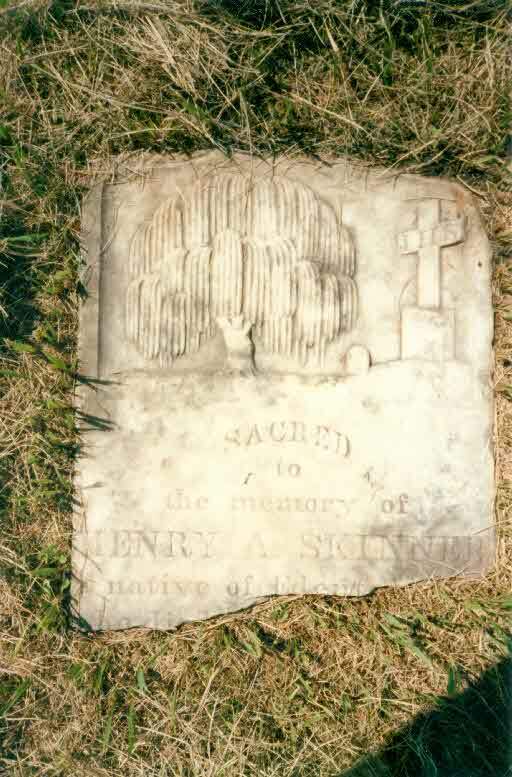 There is a marker in the Catholic Cemetery in Mobile that reads: "Sacred to the memory of Henry A. Skinner native of Edent----" The stone is broken off through the line. There is at least one other line below this last one. Edent--- is probably Edenton, NC in eastern North Carolina. Additional information from Ms. Elizabeth V. Moore, 110 W. King St., Edenton, NC 27932. Entry in Barefield is for otherwise undocumented child that died young. [S30] Marilyn Davis Barefield, Clark County Records, Page 70. [S69] Doris Seymour Wahl and Cynthia Walker Rummel, The Skinner Kinsmen, The Descendants of Richard Skinner of North Carolina, Pgs. 30, 47.